It is far too easy to dismiss the impact Sarah Aetheline Banfield may have had on her son by enabling his inappropriate ideas about his standing in the world. Hard work, education, and marketable skills are the basis of success. On her own, Sadie had few skills which were provably marketable. Her husband, Dr. S. A. Deuel, does not appear to have maintained a relationship with her and I can find no sign he provided either for her or for the child. Trophy Offered By The Tribune Is One Of s Number of Handsome Prized for Which Youngsters Contest – Arthur Deuel is listed as a sub-timer. 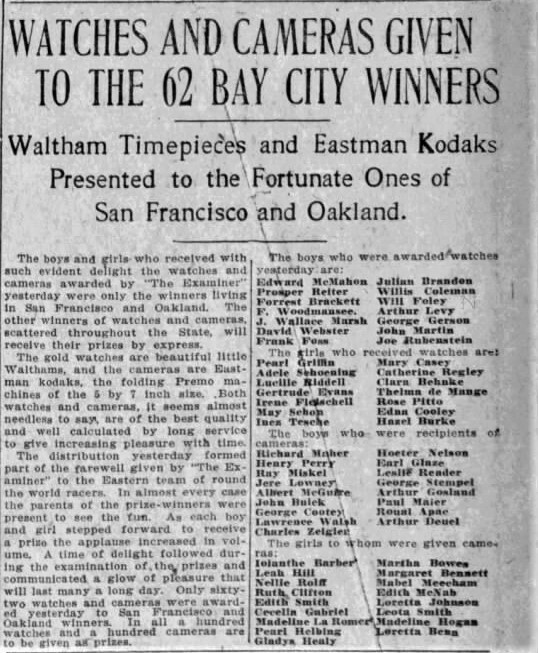 “The distribution yesterday formed part of the farewell given by “The Examiner” to the Eastern Team of the round the World Racers.” (see clipping) Arthur Deuel is listed as being awarded an Eastman Kodak, Premo machine of the 5 by 7 inch size. “Never in the history of the many novelties of which have taken place at the Idora Park skating rink has anything created such a keen interest as that which is being shown in the Progressive Club skating contest.” (article goes on, see clipping) “Among those who are already wearing the handsome club badges which are indicative of candidacy are: (Listed first are, presumably the couple, Miss May Stillman, Arthur Deuel. NOTE: The Pillsburys referred to do not include Sadie Banfield. This is a reference to my great-grandparents. “Arthur Deul, of Berkeley, the twenty-one year old son of Mrs. Arthur C. Pillsbury, who was Ethaline Banfield of Penryn, was fatally injured in an automobile accident in Bakersfield Tuesday of this week. He died a few hours later just before Mr. and Mrs. Pillsbury reached there. The Rev. Banfield died in Penryn, CA on June 24, 1889 having served as pastor for the Gold Hills Congregationalist Church there for from mid 1887 until his death.